In the pack you get 28 strips, two weeks worth as you use two strips a time. The packaging of the set is sleek and comes in a white and gold box. The gold part lifts off and in the box you get the strips and instructions. I also got some floss, mouthwash and toothpaste. All of it had a mint flavour which I really liked. They kit is designed to be used everyday for two weeks. As this was the first time I had used teeth whitening strips I had no idea what I was doing so I made sure to read the instructions. I cleaned my teeth first and then opened the strips. Each strip comes on a plastic slip and peels off. You then have to place each strip onto your top and bottom row of teeth. I only have a small mouth and did find the strips a little big so I did trim them down a little. I then pushed them into place and patted them onto my teeth to ensure they were covered. It is recommended to leave them on for 60 minutes. This does sound a long time but I made sure I was busy whilst having them on either by having a bath or doing some blogging. The strips stayed in place well and didn't move around. When I peeled the strips off I was careful as the gel sticks against your teeth so you don't want to pull too hard. Once off there will still be some gel stuck to your teeth. I brushed my teeth and the first time I was shocked. I noticed my teeth had small white patches here and there and looked a little blotchy. I panicked thinking something was wrong but it is fine! The patchy areas are caused by a loss of water from the tooth enamel and it will go away. When I woke up in the morning the patchy areas had disappeared and my teeth were normal. I found the patchy areas appeared for the first 2-3 uses of the strips and after that it didn't happen again so don't panic if it happens to you. I used the strips for just over two weeks as there was an odd day I wasn't able to use them. 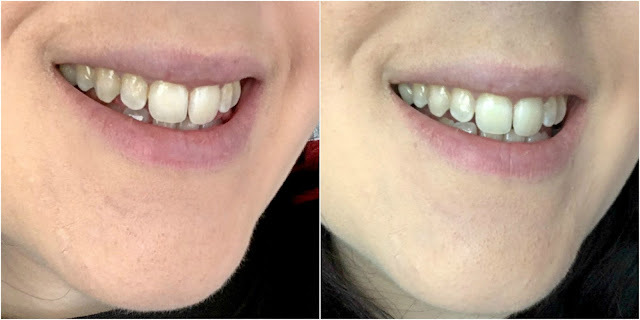 On my teeth before using the strips I did have slight staining towards the side areas and along the top of my front teeth. It is something I always worry about and it knocks my confidence. I tried to take before and after photos in the same lighting and angle so you could really see if there was a difference. I am really pleased with the results. The staining on my teeth has definitely reduced and overall my teeth appear slightly whiter. They aren't intense white which to get that you would have to get them professionally done BUT the strips have at least whitened them a few shades lighter to what they were. My fear of teeth whitening strips has disappeared. I found them extremely easy to use, yes there were a little fiddly but that was to be expected. The bonus is they are affordable at £24.95 for the two weeks of strips. 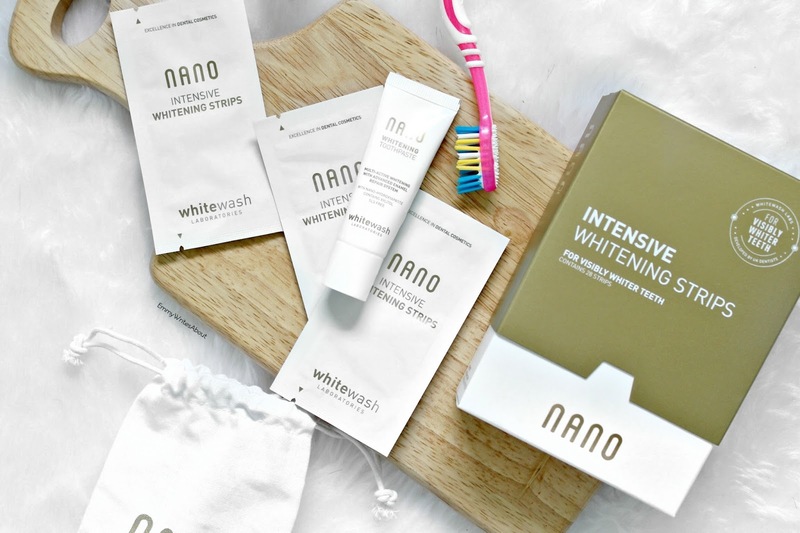 Nano Teeth Whitening also do other kits which include the toothpaste and more.